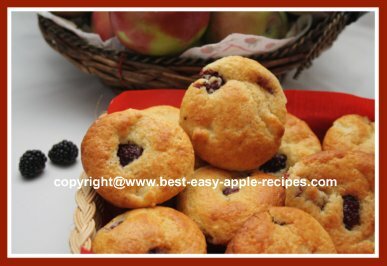 Here is a Blackberry Muffin Recipe with Apples, (see the pictures! 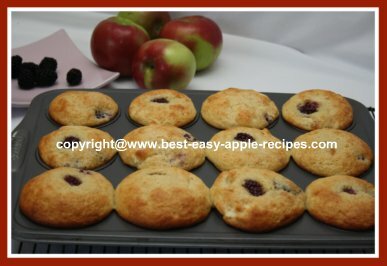 ), for the most scrumptious, moist muffins with fresh blackberries and any type of apple. 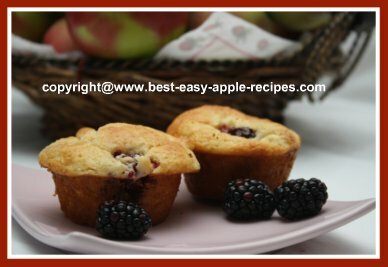 I made these delicious muffins yesterday, and they did not last for more than a day! My family loved them, and I was going to freeze most of them, for later use, but they were too good not to eat fresh! In a large bowl, using a whisk or a fork, combine the flour, baking powder, and the salt. Stir in the brown sugar, and then the chopped apple pieces. In another bowl, using a whisk, beat the eggs, and add the buttermilk, oil, and the vanilla extract, continuing to beat. Add the egg mixture to the dry ingredients, (flour), mixture, and stir gently, just until combined, do not over-mix. Gently, using a spatula or a wooden spoon, fold in the blackberries. Spoon the batter into a greased or paper-lined muffin pan, filling to 2/3 full. Sprinkle the tops with the raw sugar, if desired. Bake at 400° F for about 15 - 17 minutes or until well risen, golden brown, and firm to the touch. 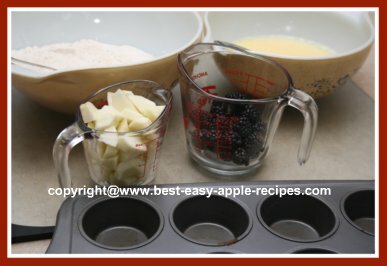 Allow muffins to cool for several minutes before removing from pan. Makes about 1 dozen large muffins. Muffins freeze well for up to a few months, provided they are wrapped properly. To freeze muffins be sure they are completely cooled then double wrap them with plastic. To heat frozen muffins, unwrap them, and thaw. To eat them warm, warm in a microwave at a low setting.